Present for the ribbon cutting were employees, friends, and family of River Town Electric owners, Nick and Jennifer Dobbs. Also in attendance were Brittany Burnett (Peoples Bank) and Pat Tackett (Ohio Valley Bank), as well as Gallia County Chamber of Commerce staff Elisha Orsbon and Paige James along with Chamber board members Anthony Sola (Peoples Bank), Amanda Ehman (Rio Grande Community College), Jenni Dovyak-Lewis (Area Agency on Aging District 7), and Brynn Noe (Noe & Saunders Attorneys at Law). River Town Electric, LLC was established in October 2017 and served its first customer, Chuck Connelly, owner and operator of the Auto Trim Center, in January 2018. Nick Dobbs started the business to complete a lifelong dream of becoming an electrical contractor and help serve the local community. 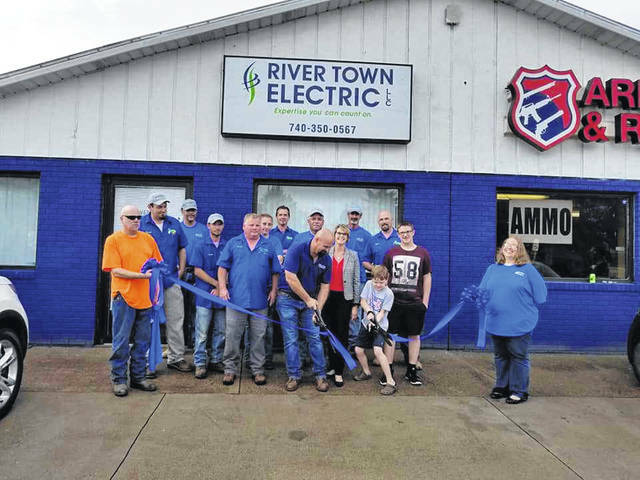 River Town Electric began service at their current location, 317 State Route 7 N., in early January, while a complete remodel was underway. The offices were complete and ready to go in May 2018. River Town Electric has grown quickly, comprised of 17 service employees, including Project Manager Tony Savage, and an additional office manager, Christina Shockey. River Town is a Certified Generac Generator dealer, installer, and service company. They are also a “Service Disabled Veteran Owned Small Business”, and a “Veteran Friendly Business Entity.” They are registered with the Better Business Bureau and a proud member of the National Electrical Contractors Association (NECA), as well as the Gallia County Chamber of Commerce. Mr. Dobbs holds a Master Electrician Certification in West Virginia and Kentucky and is a licensed electrical contractor in Ohio and West Virginia, with Kentucky soon to follow. He has almost 25 years of experience in the electrical industry and sits on the Board of Directors for the West Virginia- Ohio Valley chapter of NECA. River Town Electric is a full-service electrical contractor, able to handle all residential, commercial, and industrial electrical installations and maintenance. For more information, call (740) 350-0567 or visit the River Town Electric website at www.rivertownelectric.org. You can also find them on Facebook at https://www.facebook.com/RTENick/ and Instagram @rivertownelectric. Submitted via the Gallia County Chamber of Commerce.